Banana Worms are less than half the size of Micro Worms and smaller than Walter Worms. I feed these to the smallest sized fry up to ¼ inch such as Bettas. I use this culture instead of Baby Brine Shrimp (BBS) which is far to large. BBS are such a hassle (getting the water/salt correct, separating the shell from BBS, washing and rinsing BBS because some fry are intolerant to salt, and finally the expense of BBS production in general). Add to this the fact that the fry can take the Banana Worm even if they are too small for BBS and Walter Worm/Micro Worm. I use this food because it is so easy to culture and harvest and are even more prolific (if that’s possible!) than Walter Worms. You can feed BBS when the fry get big enough but I just use the larger worm cultures such as Walter and Micro Worm that are as easy to culture as this one, and continue with an easy feeding regime from free swimming stage to the juvenile stage, where most sized fish will then readily take the Micro, Grindal and White Worms. To make, mix the oatmeal with water and the mashed ripe banana until it makes a medium thick bowl of oatmeal mixture, then add a light sprinkling of yeast. These Worms like it dark but can stand living in lighted areas. I have them on an open shelf but keep them out of direct light. First thing in the morning there will be more worms than during the rest of the day but I always get enough to feed 4 times a day. Warmer temperatures can also speed them up when needed. The room temperature canbe up to about 85oF, and the worms will live up to 35 days, whilst producing 60 or so young each from the 4th day on. There will ALWAYS be enough Worms on hand for all the fry you can produce. Literally within days of starting your cultures with our starter culture you will see the surface of your own cultures shimmering with millions and millions of Banana Worms. To collect the Worms, just wipe the side of the container with a q-tip or children’s art paintbrush. Alternatively you can add them to a jar of dechlorinated water and then use a dropper. The Worms will live for 24 hours in the tank water, and this makes them a great food, as they don’t foul the water as quickly as other foods. You will be able to see that just the slightest amount will feed a lot of fry, as these guys are tiny. One ice-cream container culture will feed about 300 fry 4 times a day whilst in production with plenty left over. After about 10 days the culture will start to smell vinegary. At this point you should add a little it more oatmeal to the cultures to keep them going for a couple more weeks. Before you add the new oatmeal however, you should start up a new culture so that when the old culture dies off, you will have a new one going. By continually doing this you can always have live foods available for newborn fry. 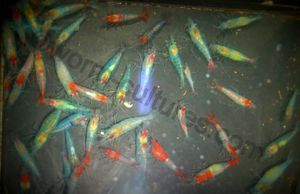 Overall these are an easy to culture live food for newborn fry. This is how a healthy Culture of Banana Worm can look with the right care and attention.